Favre Doing What Everyone Expected...Allegedly ~ The Bucky Channel - The World of Sports from Wisconsin's Perspective. 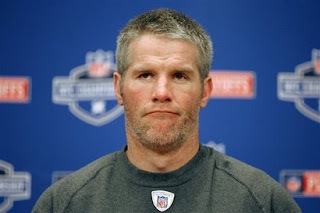 According to ESPN and Chris Mortensen Brett Favre has an itch and a desire to come back. Here is the article. Contrary to what Mortensen's source says, Favre's agent James Cook Favre is still retired and hasn't mentioned anything to him. However, Mortensen's source claims that Favre is in contact with Coach Mike McCarthy about itching to return to training camp. Apparently the pressure from his family to play is also figuring into his "itch" to play. I'm sure we'll have more on this to come, my thought is that I hope this is just speculation. I'm ready to move on and see what Aaron Rodgers has to offer. As much as I love Favre, I'm a Packers fan first and a Favre fan second. UPDATE:(sort of) WSSP loosely claims that a report out of Madison has claimed Ted Thompson has denied Brett's request and Favre has asked for his release. But the Green Bay Press-Gazette has said no decision has been made. Not sure how credible any of this is, but I thought I would keep you guys up with the latest. I really think that the whole retirement is a result of a Thompson/Favre feud. If so, showing up for training camp and forcing Ted's hand would be a master stroke by Brett...but damning for the team's sake. Aaron Rodgers is signed only through next year ('09). Let Brett Favre come back, have Rodgers play whenever Favre is sucking it up (such as throwing the ball to the other team; there's at least a handful of such games every season), hope Rodgers does well enough to increase his trade value, trade him next off-season to some team needing a young yet experienced QB -- I can immediately think of several -- and have Brian Brohm be the Packers' QB of the future. I would say, yeah, that's a pretty crazy thought. Favre coming back would set this franchise back five years. trade him. there i said it.